The vote from the team is in and our chosen ‘Good Cause’ for 2016 has been announced as not-for-profit organisation ‘Smokey Paws’! Smokey Paws is an organisation that helps fire fighters save the lives of household pets through the donation of specially designed pet oxygen masks. 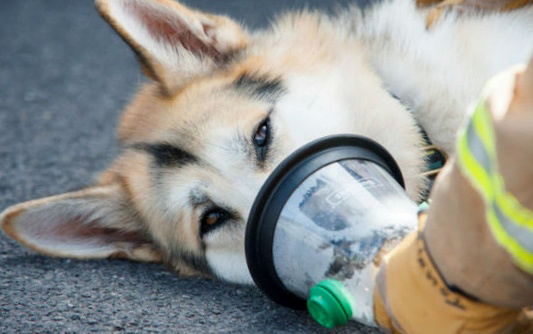 Run by husband and wife team Lynn Carberry and Brian Lockyer, the organisation is helping fire services in the UK by donating animal oxygen masks to add to their fire fighting equipment, giving pets caught in a blaze the very best chance of survival. Services that have received and are using sets of the masks include Avon and Somerset, Cambridgeshire and Kent. Lynn from Smokey Paws said: “We are so pleased to be supported by Quantock Veterinary Hospital. It is with the support and donations from the public and companies like them that allow us to donate these life-saving oxygen masks to the fire service. Nearly half of households in the UK have pets and everyday firefighters risk their life to save us and our pets, the least we can do is to give them the right equipment to aid their efforts. To show your support please visit our website or call 07340 754408 to donate and find out more. Every pet deserves the best chance of survival”. In previous years our team has chosen to support Catwork, the PDSA, Secret World Wildlife Rescue and Hounds for Heroes. We have already started planning some great fundraising challenges to raise funds for Smokey Paws – we’ll keep you posted! And please support us if you can!